A year ago at this time I was traveling through France and Spain on a church mission. It was a fantastic trip, and not your typical sort of international mission. The purpose was to spread the gospel by speaking and teaching about Celebrate Recovery (CR), a Christian 12-step program launched at Saddleback Church over 20 years ago. CR is in 69 countries with the materials translated into 28 languages. So why did I go to Spain and France? The Lord has given me a heart for His people in Spain and continues to prompt me to pray for their spiritual needs; France because of an invitation from an American missionary and colleague who invited me to share my testimony. As I mark the one-year anniversary of my mission, it’s time to pass on an update from my missionary partners and to share more about the spiritual climate in these countries. I’ve always believed that the mission was only made possible because of my personal pilgrimage to Spain in the summer of 2013. I prayed throughout the country in numerous churches and cathedrals. In preparing for that trip, the Lord laid it upon my heart to pray for a spiritual awakening in Spain. Within six months, I was invited to return and lead a Celebrate Recovery seminar in the suburbs of Madrid. While in Spain that first summer, my prayers weren’t related to Celebrate Recovery or for the Lord to use me in Spain. I liken my prayers to how Jesus spoke in parables about the harvest (Luke 8). My prayers were tilling the spiritual soil in the country. They were focused on preparing the spiritual and physical atmosphere to be open to the Lord’s work. When I returned to Spain on mission last fall, I continued to pray in the same vein, fertilizing the message that was taught in the CR seminar. Almudena Cathedral, Madrid, where I worshiped one day while on mission to Spain, October 2014. If you were to look at the fruit one year later in Spain specifically, it may not look like much. You can’t point to the launch of a CR program at any local churches. You can’t point to continued training of the participants. What you can point to is that the message was received and is being welcomed by the seminar attendees. We left the attendees with Spanish copies of Life’s Healing Choices (Ocho Decisiones Sandoras), written by John Baker, co-founder of Celebrate Recovery. This book breaks down the 12-steps into recovery choices or principles that are more easily understood in individual and small group settings. Some of the seminar attendees have worked through that book and are eager to share the information they learned. The CR content is also being integrated into the curriculum being taught at the John Wesley Bible Institute (launched after our seminar). Another exciting development shared by my missionary partner in Madrid, Pastor Josh Fajardo, is that he has been meeting with an evangelical priest interested in the program. While in Spain CR has barely been introduced, in France there is one known CR group that is up and running. That group is led by my missionary partner in Grenoble, Marvin Klein, at E.P.E.G.E. where I shared my testimony. That CR ministry has been active for two years. Regular attendance at the weekly meeting is 16 people—10 men and 6 women. These participants are wrapping up the ministry’s inaugural step study groups and preparing for leadership. Consistency and momentum grew in the women’s group following my visit. Marvin also shared with me that they are working on making the ministry more visible to the outside and plan to create a video about the program. He has continued contact with a friend who attended the Spain CR seminar who is interested in applying the CR material to teens and young adults. Marvin is also in communication with a French priest and a missionary in Barcelona who are both interested in the program. Why is this significant? It’s because of the European religious history and cultural context. From my perspective, the European church is still years behind the shift that the church has experienced in America. I’ve been in recovery for over a decade. Early on in my journey, I attended one of the oldest CR ministries in our state. It was at a time when the talk about vulnerability, codependency, and boundaries was starting to catch on in the church. Christians attending secular recovery groups like AA and Al-Anon started to drift toward CR. Slowly the church has embraced the concept of spiritual poverty. Other ministries have been birthed, books and Bible studies have been written, and sermons preached—all pointing to some of the key concepts taught and practiced at CR. This results in Good News for Christians in America. However, I still believe that if people truly embraced their brokenness, CR meetings would be standing room only every week. France and Spain also both have deep spiritual and emotional wounds related to the Church. It’s similar to the deep divide that occurred in the United States when the Civil War separated our nation between the North and the South over slavery. With the birth of the Protestant Reformation Movement by Martin Luther in 1517, France became divided in its religious beliefs. 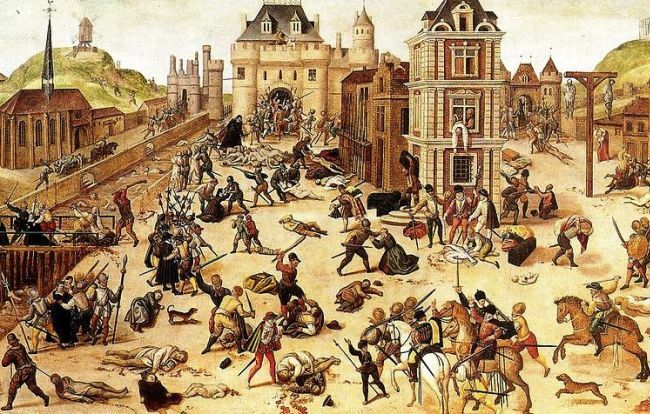 This led to bloody massacres, a series of religious wars, and forced conversions to Catholicism. Intense animosity still exists, handed down from generation to generation. Unfortunately, Europeans in general have turned against the organized church. The spiritual history in Spain is no less traumatic with the blood of Christian martyrs buried in the soil. The Protestant Reformation Movement never made a stronghold in Spain. However, the Spanish Inquisition was very effective for over 300 years (1478-1834) at keeping heretics to a minimum. The goal of the Inquisition was a pure and unified Spanish-Christian race. In 1492, over 150,000 Jews were expelled from Spain. Another 750,000 remained and forced to convert to Catholicism. It wasn’t until earlier this year that Spain finally passed a law to grant their descendants the right to dual Spanish citizenship. Although Spain is considered a Catholic country, most Spaniards don’t attend Mass or practice their faith. The country’s Catholic roots and traditions are prevalent in the government, the monarchy, the culture, and the celebration of holidays and religious feasts and festivals. Sadly, towering Gothic cathedrals serve more as museums and tourist attractions than working churches. 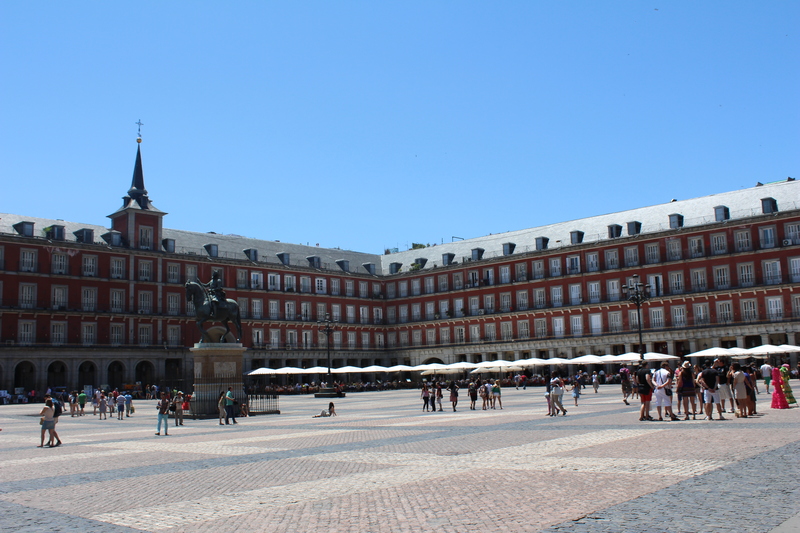 Plaza Mayor, Madrid, a popular tourist attraction, but few realize that heretics were burned at the stake here during the Spanish Inquisition. Thankfully I got to attend Mass at a few of these cathedrals and toured several of them as well. It was where I did my best Kingdom work, praying in these sacred structures that weathered the spiritual and physical battles of centuries gone by. It was like being on Holy Ground. I did the same while in France last year, most notably by attending Mass at Notre Dame while on a short layover in Paris. I still have a vested interest in the fruit being produced in these countries as I continue to pray for their spiritual renewal and healing. It’s one way I can be used by the Lord and have an impact in the Kingdom in spiritual ways unknown to me. A spiritual mentor once told me that we can change the world if we are willing to be invisible. I’ve been blessed to be visibly used as the hands and feet of Jesus in France and Spain on my mission last fall. But it started with being invisible in the summer of 2013. What I think we tend to forget in our busy American lifestyle is that prayer is the work. Thankfully that message has been resonating in theaters across America over the last month with the release of War Room, and its message to fight your battles in prayer first. Wherever we are, as Followers of Christ, we have access to our Heavenly Father, to Jesus, and the Holy Spirit. Let’s prepare the way for all we do in His Name by preparing the atmosphere of our hearts and the physical and spiritual lay of the land in prayer. To support the CR work in Spain, click here. To support the CR work in France, click here, and select ‘Klein’ on the drop down menu. And please help fertilize the soil by lifting their efforts in prayer to bring spiritual renewal and healing into their countries. Great blog written by our sister in the Lord Ardis Nelson!